Why are we seeing more school threat hoaxes by area students? 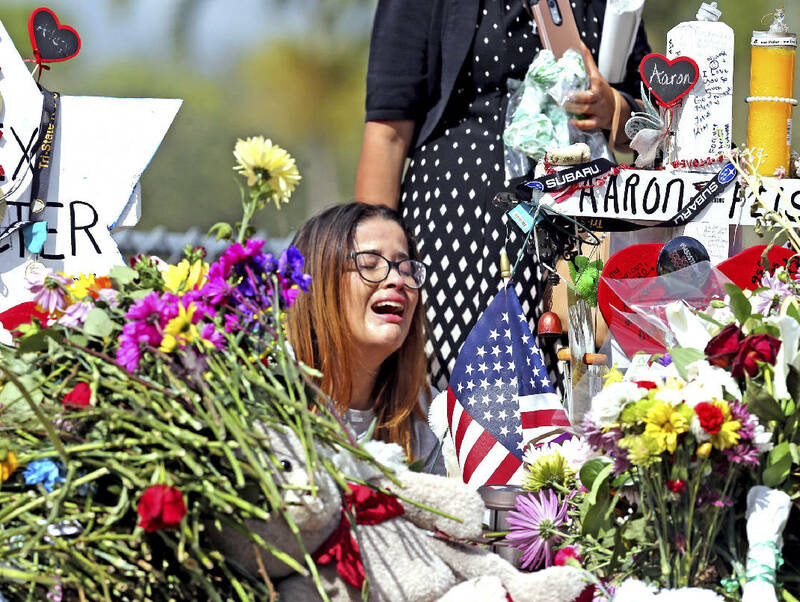 Marjory Stoneman Douglas High School former student Ariana Gonzalez weeps at a cross of slain Marjory Stoneman Douglas coach Aaron Feis, on a hill honoring those killed, Friday, Feb. 23, 2018, in Parkland, Fla. In the almost three-week period since 17 students and teachers were killed at a Parkland, Fla., high school, nearly a dozen teenagers have been arrested for posing threats to local schools. A Ringgold, Ga., high school student is accused of creating a Snapchat account and making it look as if she was the target of a dangerous plot. A Chattanooga girl created a meme that parents perceived as a threat. Three Bradley County, Tenn., students were arrested after threatening to shoot up Bradley Central High School, and another student was arrested in Meigs County for similar threats. Last Friday, two boys were charged with felonies after bringing an unloaded gun to Dade County (Ga.) High School — days after another student at the school was arrested for scrawling a threat on a bathroom wall. 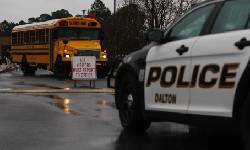 Daisy Elementary School was evacuated the week after the Parkland shooting after a bomb threat was found written on a bathroom wall, and a teacher was arrested in Dalton, Ga., after firing a gun in his classroom at Dalton High School. It isn't uncommon for schools to see an uptick in reports of threats or possible concerns after a mass shooting makes national news, officials say. There have been 797 school-based incidents and threats across the nation since Feb. 15, according to the Educator's School Safety Network. The "why" behind such incidents is where some experts disagree. "People seem to be very sensitive and hypervigilant because of the incident and because of ... concern that it could happen again," said Lt. Shaun Shepherd, administrative supervisor for the Hamilton County Sheriff's Office school resource officer program. "Kids and adults tend to report it more often on the heels of one of these events." The increase in threats isn't unique to the weeks after the Parkland shooting — upticks often occur after major shootings, according to the National Association of School Resource Officers. "It certainly historically increases I think the media attention adds that fuel to that sometimes," said Mo Canady, executive director of the association. "The why is maybe impossible for any of us to answer." Canady thinks heightened awareness and teenagers' desire for attention can fuel copycat or hoax threats after a major national incident. Canady also believes that social media can allow for people to take comments further than they might have originally intended. "I think that it's become clear that people are much braver when they re sitting behind their device," he said. "They are much more willing to spout something out. People get this idea, 'Well, it's my First Amendment right to say anything I want to.'" Dade County Superintendent Jan Harris, who addressed the recent incidents in her schools at a safety meeting Monday night, agreed. "I think that whenever we have a horrific event, it draws many of us to it," Harris said. "While many of us are lamenting such events, there are others [who] aren't mentally strong, and it plants the seed in some people's minds that 'this is how I can gain notoriety.'" Even when student make threats they don't actually plan on following through with, Harris said, she believes they aren't fully thinking through their actions. "Kids have what psychologists sometimes call the 'superman complex.' They think, 'That's not going to happen to me. I won't get in trouble,'" she said. "They don't have the best of judgment." Shepherd said threats — both real and false — put undue stress on law enforcement and the community, leading to wasted time and manpower. "We as an agency along with other agencies take it very seriously and we investigate it until we discover whether it is a real, viable threat or a hoax," he said. "We can't take any chances." Sgt. Josh May of the Chattanooga Police Department said one of law enforcement's biggest problems is with the viral nature of threats posted on social media. "It's time-consuming to track down these threats, track down the social media. ... We fight the viralness of the post and the situation," he said. "We can't outrun them sharing it to 1,500 friends at one time, we are fighting paranoia and pandemonium. It's extremely time consuming." Hamilton County Schools Superintendent Bryan Johnson finds increased reports to the district's tip hotline encouraging. "It's encouraging in that people are really looking out at things that concern them," he said. "I think there's an increased sensitivity in regards to what they post." Johnson said the district is mindful of the part social media plays in students sometimes crossing the line or making unintended threats. "We encourage parents to speak with their children about what they're posting. Nothing can be taken as a joke, everything is taken very seriously and investigated," Johnson said. "We encourage our teachers and principals and our parents and students to be mindful of what they're posting, because there are not only school consequences but legal consequences, as well." Many of the students involved in recent scares have been criminally charged with acts ranging from disrupting a public school (a misdemeanor) to terroristic threats and acts (a felony). After two boys brought an unloaded gun to school in Dade County, Sheriff Ray Cross issued a statement about the severity of such actions. "Any incident involving threats or weapons in the school system will be prosecuted to the fullest extent that Georgia law allows," he said in a statement. "These types of bad decisions can have lifelong consequences, and you must think before you act."